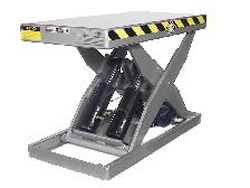 This 24" Travel Scissor Lift Table (60"W max) is an economical, heavy-duty high-speed electrohydraulic scissor lift with a 24” of vertical travel. The features include scissor leg roller entrapped within the base frame and platform, single-acting cylinders with positive internal stops, and scissor legs bolted to base frame and platform at fixed (clevis) end, for enhanced maintainability and ease of disassembly. 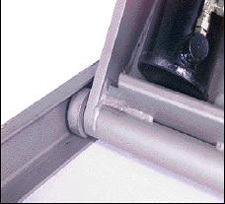 Heavy-duty welded construction designed with a 3-to-1 safety factor, complies with ANSI MH29.1-1994. 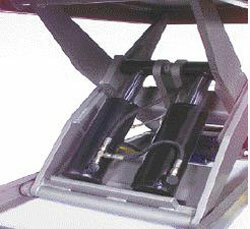 Specs: platform size 36" x 36"; base frame 35 1/2" x 35", lowered height 7 1/8", raised height 31" and 1 1/2 hp motor. Available with custom platform sizes up to 60" x 60" call for pricing. Other available capacities are 3500, 4500 and 6500 pounds. Power supply options are for 1 1/2HP motor.